INTER MILAN TICKETS SEASON 2018/2019. 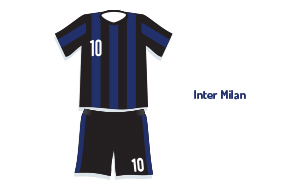 Inter Milan made history in the 2009/2010 season when they became the first Italian team to win the treble (League + Domestic Cup + Champions League). But since then, Inter Milan have struggled to achieve more titles. Last season Inter finished 7th in Serie A. Inter Milan has a big rivalry with the other big team from Milan: AC Milan, both playing at the spectacular San Siro stadium. In 2018/2019, Inter Milan will be a serious contender for the Italian Serie A as they will try to get back on winning tracks and qualify for European competitions. With players such as Mauro Icardi and Ivan Perisic and some other top players from all over the world, Inter Milan is bound to provide you with some very exciting football. Inter Milan will mainly compete with Juventus, AC Milan, Roma and Fiorentina. Not only we have tickets available for Serie A matches, but also we offer Inter Milan Coppa Italia tickets. All ticket orders are 100% guaranteed. 1st4 Football Tickets sells Inter Milan tickets for home and away matches. See Inter Milan playing at San Siro in Milan Italy! You can either buy your Inter Milan football tickets online through our secure online booking system.